Using Azure Active Directory (Azure AD), you can edit a group's settings, including updating its name, description, or membership type. Select Azure Active Directory, and then select Groups. The Groups - All groups page appears, showing all of your active groups. From the Groups - All groups page, type as much of the group name as you can into the Search box. For the purposes of this article, we're searching for the MDM policy - West group. The search results appear under the Search box, updating as you type more characters. 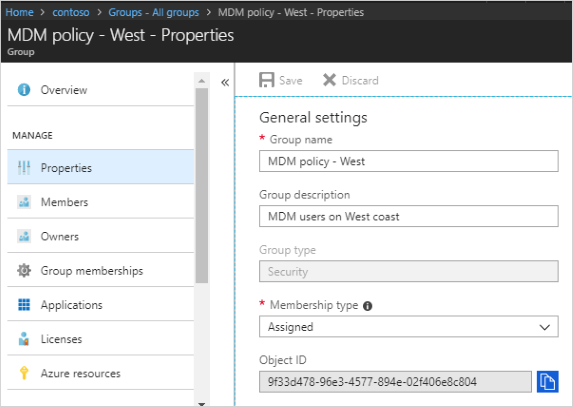 Select the group MDM policy - West, and then select Properties from the Manage area. Group name. Edit the existing group name. Group description. Edit the existing group description. Group type. You can't change the type of group after it's been created. To change the Group type, you must delete the group and create a new one. Membership type. Change the membership type. 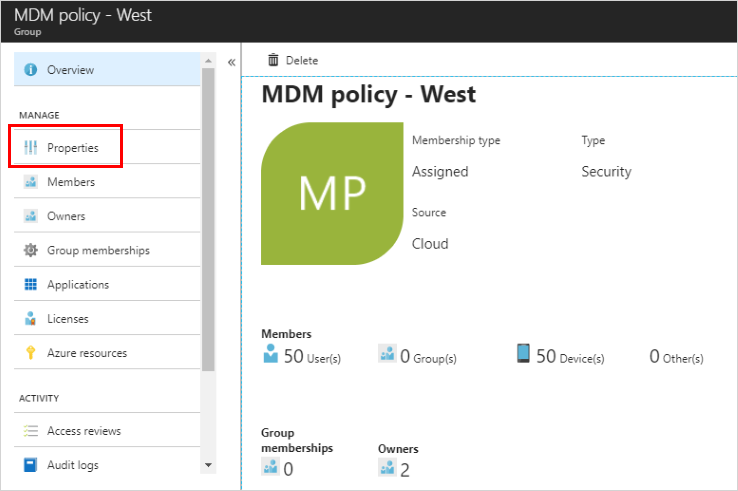 For more info about the various available membership types, see How to: Create a basic group and add members using the Azure Active Directory portal. Object ID. You can't change the Object ID, but you can copy it to use in your PowerShell commands for the group. For more info about using PowerShell cmdlets, see Azure Active Directory cmdlets for configuring group settings. These articles provide additional information on Azure Active Directory.